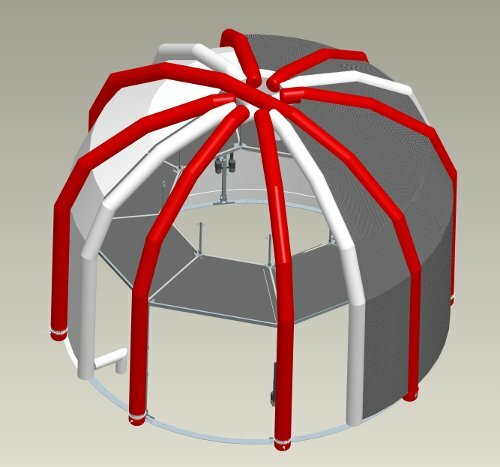 The Badger X-Loft team was selected as the winners of the 2011 XHab competition! The Badger X-Loft (BXL) team was selected as the winning design from among the three finalist schools and was awarded $10,000. The team will now travel down to Arizona in August or September to demonstrate their design as part of NASAs Desert Research and Technology Studies (Desert-RATS) field test. The BXL team kindly thanks all who provided assistance to the BXL project. “Interfacing with other peoples designs is paramount. Deciding whose design to change... isnt as easy as it seems,” says Marron. Lucas reminisces, “Getting the honest opinions about our habitat from an astronaut was an amazing experience and I realized as I drove back to the Houston airport... that the rewards of the last year were well worth the trials.” It seems as if much of the team agrees with Julie Mason when she says, “Post competition, it feels awkward to be away from Xhab until Arizona, but I feel lucky to have been a part of a great team and a project about which I'm both passionate and proud,"
November 8, 2011 The Badger X-Loft team will be presenting their project at the UW Space Place. UW Space Place is an astronomy outreach center, which offers a variety of educational opportunities for schools, school teachers, and the general public. Among them are monthly guest presentations in the Space Place lecture hall. The Badger X-Loft team will be presenting a 50 minute discussion of the details of the habitat and the project in general. The X-Loft Habitat greets the day in Arizona. October 10, 2011 The Badger X-Loft team has returned from a successful Desert Research and Technology Studies (D-RATS) program. The team poses in front of the habitat. 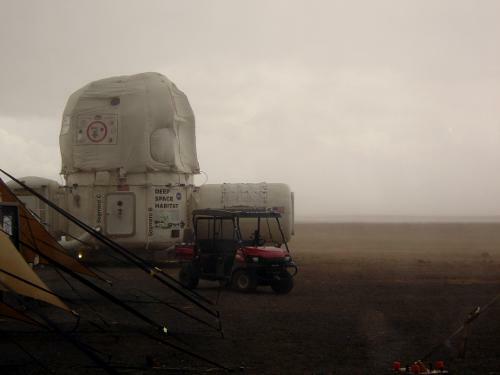 A storm rolled through during the missions in the dessert. 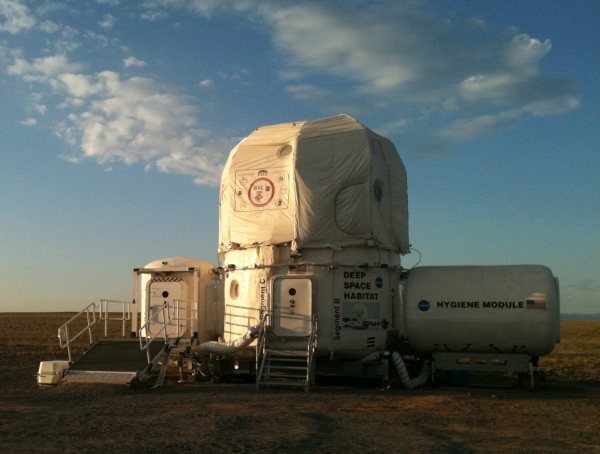 As part of the competition requirements, the habitat was required to withstand 50 mile-per hour winds. In this storm, winds were gusting as high as 60 miles per hour. As part of D-RATS, the X-Loft team assembled their loft tested the habitat in a number of simulated missions and habitability studies in cooperation with NASA engineers and astronauts helping to monitor essential systems like air-beam pressure using iPods. One night, Julie and Jordan tested their design by staying the night in the loft in the company of NASA Architect Scott Howe and his wife. 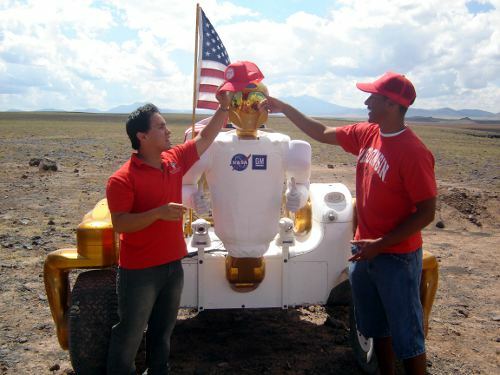 Will and Aaron make sure that Robonaut doesn't get a sunburn in the heat of the Arizona Desert. 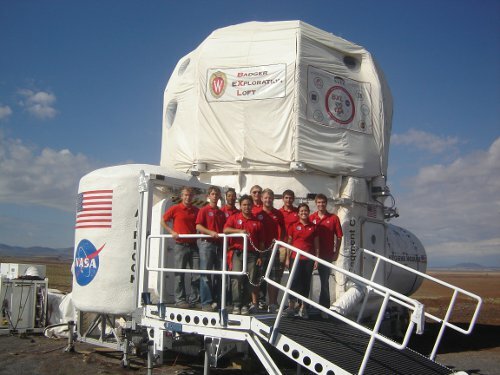 The team inside the Space Exploration Vehicle, a rover-like vehicle designed to allow astronauts to explore the surface while providing for multiple day excursions without the need to return to base for provisions. May 21, 2011 The interior structure and electrical systems for the linear actuators and lighting are coming together quickly. Updates have been sparse because we have been busy in the lab. A peek into the lab while the skeleton structure of the loft is being assembled and tested. Linear actuators used to raise and lower the lower level structure have been installed and are currently being wired and tested. The lower level structure can be seen here in lowered position during testing. May 13, 2011 Design for the X-Loft is completed! A complete set drawings have been shipped to NASA. All we have to do is finish building. An exterior rendering of the X-Loft final design showing the outer shell. A cutaway rendering of the X-Loft final design showing the internal platform, structure, and inflatable systems. March 29, 2011 Badger X-Loft members showed students how to build tiny rockets using straws and balloons while answering questions about the X-Loft project as part of Science Night at Park Elementary School in Cross Plains, Wisconsin. 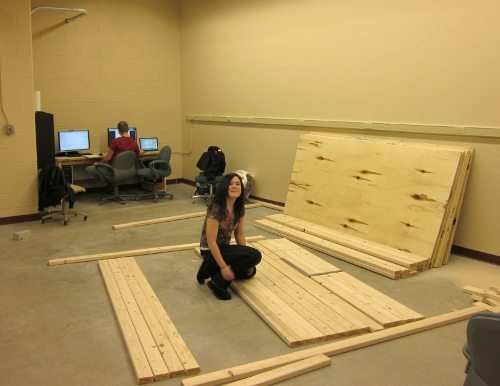 February 15, 2011 - The Badger X-Loft team started a new semester and began preliminary construction for the prototype by securing a lab in the basement of the Mechanical Engineering building that is ideally suited to our needs. We are anxious to start, and have begun moving into the new room by gathering essential items like tools and materials. The team began assembly of a platform to raise the loft prototype off the floor and allow easy access. To document the construction progress over the course of the semester, we installed a time lapse camera in the lab. The resulting footage will be shown at our final presentation in Houston this June. Suggestions from the Critical Design Review led to the investigation and reanalysis of the deployment process for the loft. 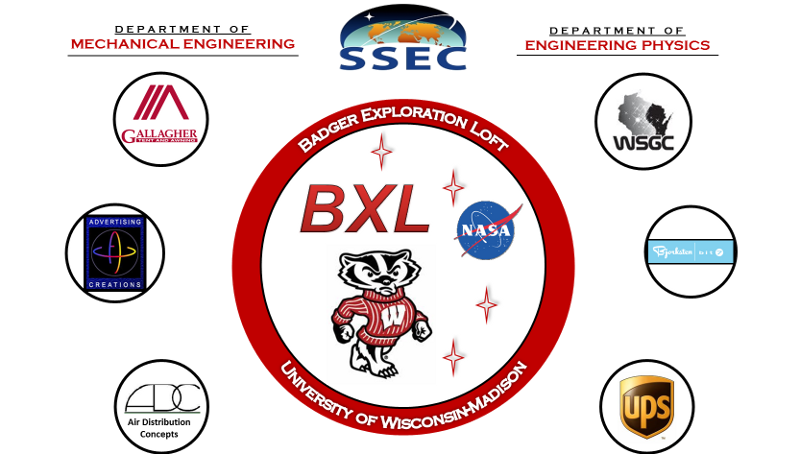 Thanks to the hard work of the team and another generous guest lecture from Randy Illiff, the teams systems engineering expert, Badger X-Loft is confident in their solution and major ordering of components will start soon. In order to involve the public and generate excitement and interest in our project, plans are underway to visit local Madison schools. 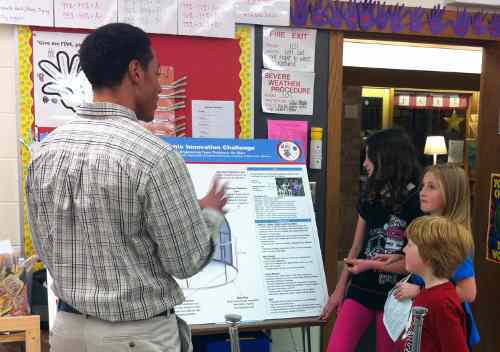 The team will demonstrate and explain our project and answer students questions as part of both Math Week and UW Madison Science night. 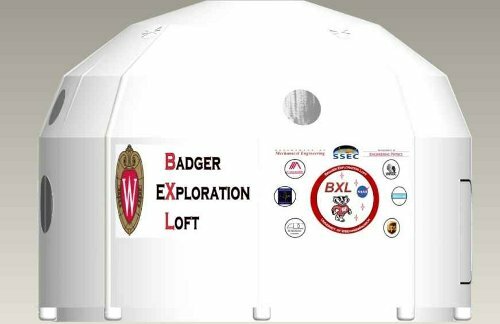 Badger X-Loft will also give guided tours of our lab as an exhibitor in the 2011 Engineering Expo which will occur on the UW-Madison campus in April. Stay tuned for more updates and pictures of the prototype itself! November 4, 2010 -Terry Tri, a NASA HDU engineer, visited the BXL team in Madison in order to evaluate our teams progress in the Preliminary Design review. While here, Mr. Tri attended our presentation in person. As part of the presentation, members of the BXL team demonstrated the resources available to the team at the University of Wisconsin Madison. Marcus and Julie demonstrated our campus computing resources, while Dr. Elder walked Mr. Tri through the engineering student shop where many of the parts for the final prototype will be fabricated. The BXL Team awaiting the start of the Preliminary Design Review. During the Preliminary Design Review presentation, the team shared the current design for the loft with Mr. Tri and other NASA engineers who attended via conference call. NASA representatives praised Badger X-Loft for our focus on outreach and our demonstration of a small scale model of our design. Be sure to check out the rest of the pictures from the Preliminary Design Review. After the presentation, the team took Mr. Tri to The Great Dane, a local Madison restaurant on Capitol square. The team enjoyed delicious food and the cheese curds supplied by Dr. Elder. Badger X-Loft looks forward to the Critical Design Review as well as continued outreach activities. Stay tuned! 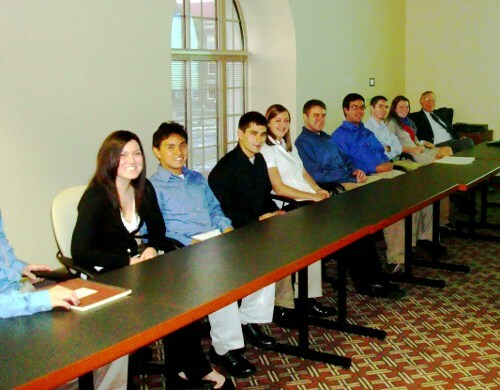 October 26, 2010 - The Badger X-Loft teams next major design review with NASA is coming up quickly! Terry Tri, a NASA engineer working on the Habitat Demonstration Unit (HDU) that our loft will interface with, is coming to Madison to view our presentation. We look forward to his visit so that we can show our construction workspace as well as the other facilities available to us in the college of engineering. To help us gain a better understanding of the NASA hardware that our prototype will interface with, seven BXL team members traveled to Johnson Space Center to see the Habitat Demonstration Unit (HDU) in person. While there, we held meetings with NASA engineers, took measurements of the HDU, and toured several NASA facilities. Upon returning to Madison, the team is flush with ideas and plans for our own inflatable loft. Be sure to check out more of the pictures from the Johnson Space Center Trip. 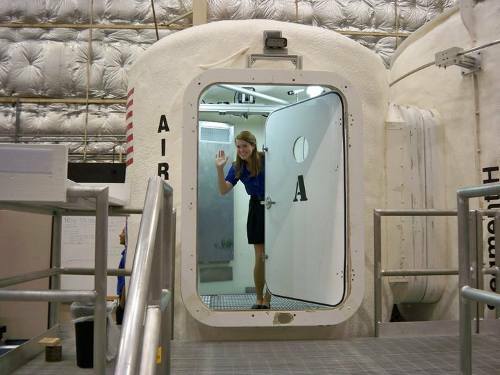 Ariel inside the HDU airlock. October 14, 2010 - Work on the Badger X-Loft project has been progressing steadily over the past month. Since NASAs selection of BXL to embark on this challenge, our team has seen conceptual designs progress into real solutions ready to be constructed over the coming spring semester. Team member Jordan Wachs hard at work. In preparation for our first major presentation, the team built a small scale model of the prototype out of foam core. This provided a more physical sense of the prototype to help the team get a better understanding of the layout of the structure. It also presented our human ecology teammate with the opportunity to do the first of what will be much sewing over the coming months! Although our first systems definition review went well, there are still many design reviews to come. To gain a more comprehensive idea of the layout of the Habitat Demonstration Unit, the device our prototype must interface with in June, several team members are traveling to Houston to see the hardware in person. This will give us many new ideas of how to design our unit to NASAs specifications. The team had their first get-together outside of the engineering campus at Vilas Park shortly after the systems definition review. Dr. Elder cooked up quite a spread for us to enjoy on the beautiful Madison afternoon. 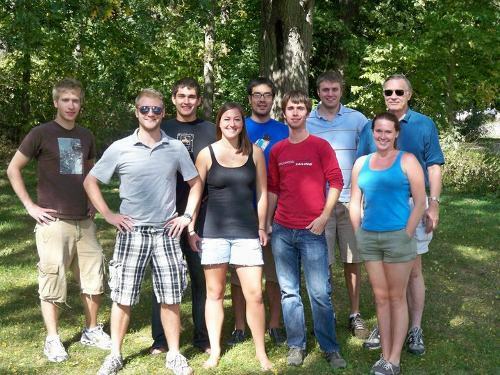 BXL team at a picnic in Vilas Park (left to right: Max, Sam, Jordan, Nicole, Nate, Mike, Mark, Ariel, Dr. Elder). Stay tuned for the results of our next design review and exciting outreach competitions to participate in as well! September 29, 2010 - Smart Planet published an interview with advisor Fred Elder about the Badger X-Loft Team and our project. September 23, 2010 - Badger X-Loft added a section on education and outreach to provide resources for educators and parents to teach their children about engineering and the design process. 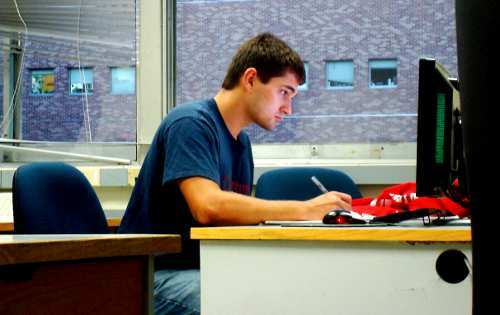 September 21, 2010 - A number of organizations have run stories about the Badger X-Loft team including the University of Wisconsin-Madison, the Daily Cardinal, the Badger Herald, and Madisons ABC affiliate WKOW 27. 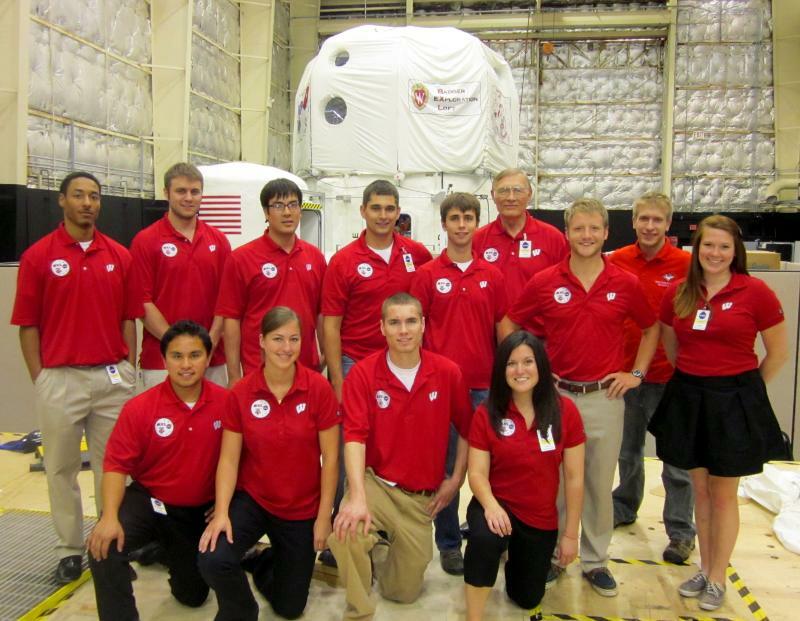 August 30, 2010 - NASA selected UW-Madison Badger X-Loft as a finalist in the NASA Lofts in space challenge. The other two finalists selected are Oklahoma State University and the University of Maryland. If you have any questions or comments please feel free to email us at elder@engr.wisc.edu.